We are fortunate at JMDA to have two very talented females in our product development team. Hanna and Elena both graduated from Loughborough University, Hanna with an Industrial Design and Technology BA, Elena with a Product Design and Technology BSc. Industrial Designer Hanna provides invaluable support to JMDA’s design team. Hanna meets with clients looking to design a new product and captures their ideas, styling requirements, functional detail and intended markets. 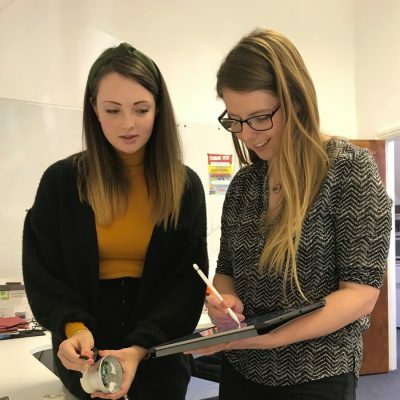 Hanna and the team will then go on to develop concept solutions to adhere to the project brief, evaluating each concept to ensure the solution is a viable, usable product within the commercial realities and design objectives. She will present her imaginative ideas to the rest of the team through creative sketches, renderings and styling geometry CAD models. JMDA’s structured engineering approach is driven by a wide breadth of experience, technical skill and creativity. Elena is a Junior Design Engineer here at JMDA, and it is her role to take these styling geometry CAD models and ensure the engineering solution will meet performance and function expectations, with cost effective manufacture. Elena, along with the rest of our engineering team, use a selection of 3D CAD modelling, material and process selection, tolerance stacks, plastic and FEA analysis to refine the designs to work with specific production and assembly methods. In some cases, Elena will run simulations to check mechanisms behave as designed and use our in-house 3D printer to print small scale plastic prototypes to ensure they work as intended. According to statistics published by the Women’s Engineering Society, women make up less than 11% of the engineering sector in the UK. But why? Some believe secondary education in the past has had a major part to play. It is thought that schools have failed to inspire young women to join the industry, nor explain how diverse and far-reaching the opportunities are in an engineering career. Historically there has also been the issue surrounding gender bias too. UK society has, in the past, portrayed engineering roles to be mostly in male dominated industries, rather than inquisitive females considering a successful career in engineering. Thankfully this is no longer the case. With a large skills gap looming and the need for a more diverse workforce, schools are more focused on highlighting equality and promoting higher education in engineering as well as in science, maths and technology industries. Keen to support the local community and inspire more people, especially women, to choose a career in engineering, members of the team have visited a nearby middle school to give a presentation to pupils about JMDA and the benefits and challenges of a career in industrial design/engineering. Furthermore, we’ve agreed to help support the school with their year 7 product design classes. We shall take it in turns, over the course of the year, to visit the school to give tutorials and discuss the student’s product design progress. This, it is hoped, will engage both male and female students and equip them with a greater understanding of the full product design process from concept through to manufactured product. In addition to practical onsite support in the classroom, JMDA have very generously funded a site license of SOLIDWORKS CAD software which will allow pupils at the school to develop their designs on the computer. SOLIDWORKS is the most widely used 3D design software in the world and is an innovative learning tool for design and product development which is easy to learn and exciting to use. JMDA is an award-winning design consultancy with over 25 years’ experience in new product development. Our holistic and integrated process allows us to support clients at every stage in the product development cycle. Our experienced team consists of creative industrial designers and talented engineers who work collaboratively to create innovative, cost efficient and robust solutions that not only fulfil the client’s requirements but meet the criteria for tooling and can be manufactured effectively. JMDA is an equal opportunities employer and we are passionate about empowering women to work in fulfilling careers within engineering. Hoping to address the shortage of skilled women in the engineering industry, we are proud to be supporting Abbey Road Middle School this year with their Product Design classes and besides this, offer exciting work experience placements to local students and school leavers.